How do you add life to something that is already alive? Well, for a franchise that literally is the representation of an entire medium, you don’t. Sure, Fire Pro and smaller titles exist, but 2K’s WWE game line have been the way to experience sports entertainment for years now, and that is not going to change anytime soon. 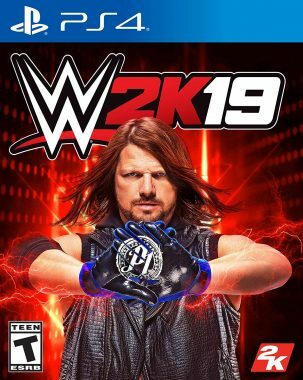 What we have this year is WWE 2K19, featuring a new cover athlete, a few new upgrades and updated roster, and a few tweaks to the overall experience. Can this year’s iteration pull it together and act as the proud symbol of our sport we all want it to be, or is this entry yet another disappointment that will have fans recalling the great wrestling games of yore? Let’s find out. I will start off talking about story by saying that if you stick to general base Exhibition matches, you can get a bit of a neat narrative by just playing as normal talent as feuds erupt, briefcases can be cashed in, and run-ins can occur to make you want to jump right back in for more. Sure, it isn’t just like the show, but it is serviceable and a tad refined compared to what we experienced last year. Another form of story is the Daniel Bryan showcase, featuring a mesh of clips and animated cutscenes that reflect history as players trek through an entire career. 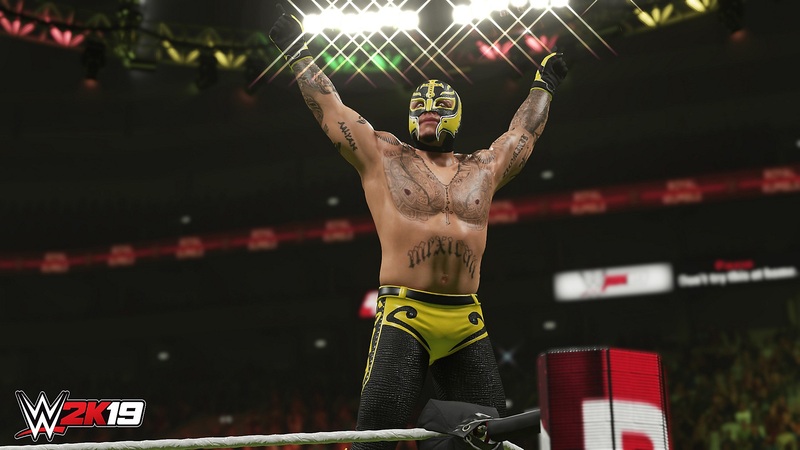 Finally, and most importantly, there is MyCareer, which acts as the game’s main course of sorts, where the player takes a custom Superstar from the independents to the main stage of WWE. Yes, no more starting straight from NXT. Now we get to experience Barron Blade as he runs an indie fed with no cash or experience, and criticizes nearly everything other than WWE the entire time before finally taking on the WWE with his own brand. The player then expands their career to the big time, and is allowed to experience feuds and more in a very shaky narrative that really is well made in production value, but shallow as you begin to see it unravel. I will cover more about the mechanics of this mode in a moment, but for those wanting more story in their WWE games, well, you have this I suppose. The gameplay really isn’t too different in WWE 2K19 than it was in prior versions. 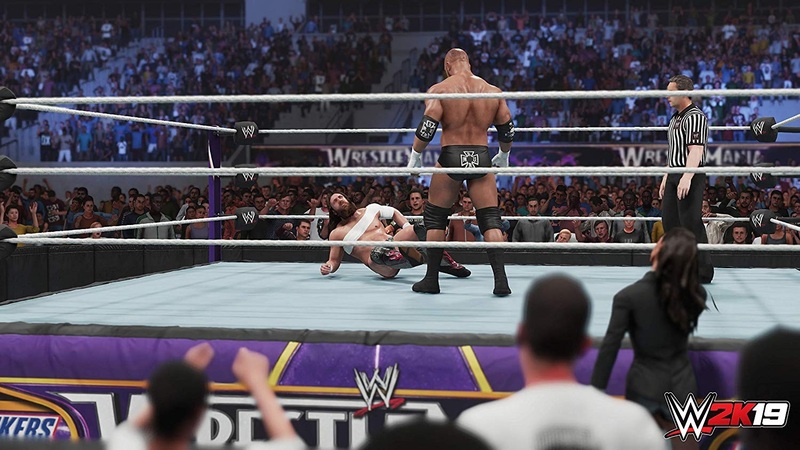 These Superstars still run, taunt, and perform the same, with very little change to the actual gameplay. There are a few slight additions, as one of which allows you to pick two boosts for your Superstar (as seen in prior titles) such as resiliency, possum pins, and so on at the start of the match, and earn it slowly for a payoff before the end. It sounds like an improvement, but if you consider that this was already available and now is just being served up in a new way, then it really is nothing special. That is kind of how all the upgrades work in this game. They are just handled as new ways to fix old problems. Most of which that was fixed was not even broken, so the game overall is kind of stuck in the same spot it has been in with a new coat of paint. Is that bad? Well, for some match types it is, as the slight changes and lack of change with bugs that are years old are what really harms the overall experience. One of the worst “upgrades” comes in the form of the new Hell in a Cell. Listen, the old Hell in a Cell was ridiculous. It was too big and escaping it felt too artificial. The classic games just let you slam through the walls for quick gratification, and 2K19 really wants to do that with this revamped match type. Sadly, it doesn’t work that way. While in between the cell and the ring, players can only crawl in one direction and do no moves other than preset grapples and punches. Even walking is a chore, as the game pulls you in one direction. You can get through the wall after whipping the opponent a few times into the same piece, but placement is now even harder due to this bizarre crawling, as players now automatically approach the other side and cannot even turn around without tedious effort. Submission matches are horrible. This ring around the circle mechanic, where one color chases another with damage ratios changing advantage was terrible when it was introduced, and is now in the spotlight, largely due to its heavy use in the new 2K Tower Mode, as well as Daniel Bryan’s Showcase. Seeing a submission requirement on anything other than normal difficulty can drive one insane, as this mini-game makes winning not even gratifying when you are able to conquer it by luck. Speaking of the tower modes, 2K Towers kind of take that Mortal Kombat scheme and flips it a bit, allowing us to go through opponents in themed events. I love the concept and some of the matches are fun, but again – with such terrible mechanics revolving around submission bouts and even a broken pin system that sees stuttering and slowdown before it pops up AFTER the three count, it is just not ready for a game that still begs for polish. 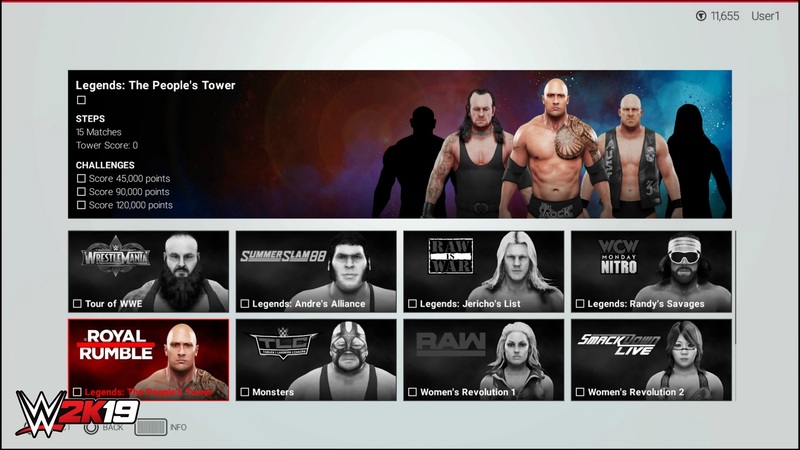 I think this would be amazing if every match in 2K19 were as fun as the new cage matches or six-man elimination tags, but when you lose an entire tower due to a bug, well, it takes away from the brilliance immediately. There is fun to be had in this game, but it comes in just casual play. Creation has not changed much, but it still is very well done and is still rewarding as you see your Superstar trot to the ring. Most matches are fine, as WWE 2K19 is basically the same as 2K18 in many ways, but old problems with ladder match mini-games and gamebreaking rope exits in over-the-top fare still exist, which is honestly unacceptable at this point. I hate to be so negative, but this is a game franchise I have gotten year after year since I was 12. I am 31 now and am smart enough to know what we should see, and that is not what we are getting here. MyCareer is not just a bad mode gameplay wise, but a commentary on why this industry is going to fail if it doesn’t stop asking for further handouts. The entire mode is a micro-transaction fest. You want a DDT? Buy a loot box. Want a new hat? LOOT BOX! Want mascara? Better get it from a loot box! You can unlock parts for your wrestler with points, but let me tell you that this mode makes that climb feel like an eternity as there has to be over a thousand things that have to be acquired from those little packs of cards. And yes, the game’s difficulty for this mode is altered to make if feel needed to upgrade with packs. With already semi-broken mechanics blended with artificial difficulty that simply wants you to upgrade via real currency in order to progress forward, you have a mode that is pure trash. Absolutely one of the worst dumps contained behind walls in a game that I have ever seen. Sure, the loot boxes are contained only for this mode, but man do they ever reek of greed. Oh yeah, they added big head mode and filters. Neat. WWE 2K19 has gotten a slight visual downgrade. I think it effects the look of skin now, as the models look a bit more plastic and less detailed. Not too bad, mind you – but the downgrade is noticeable due to the rest of the models retaining their other features (hair, teeth, ect). Animations are fine, as the game seems to flow evenly. There are still a lot of in-game hiccups with body parts getting stuck in the environment and wrestlers turning into pretzels due to floppy physics, but most the time the moves look fine. The HUD for the pins and submissions of course is not so fine, as I experienced a lot of grief with the pin system not even appearing until the 2 or 3 count often, and the submission system’s little mini-game is just awful as it is. Oh yeah, I should also bring up creation mode here, as while the mode is great, the new white backdrops and paper thin selection tool (you know, the part that highlights one piece you have selected) are hard to see on even a big television, making for a bit of eye strain in general. As for the roster, well, outside of Dana Brooke’s gray hair and Sasha Banks animating like Pengu in the face, I can say bravo to the team as these models look awesome. I want to like the sound. I do like the Superstar themes within the game, but the rest is awful. I have never, ever turned off commentary in a game until 2K19. Michael Cole, Cory Graves, and Saxton all may have recorded lines, but the editing is a nightmare and they break the flow of every match. Want to hear Graves go on a tangent about cage matches during a women’s singles match? Well, you will be covered here. Oh, you also want to hear Cole scream the same catch phrase during a Superstar’s entrance every single time they come out? We got that too. They repeat the same lines over and over, they talk over each other, it is just a mess, adding no atmosphere to the experience and making it cringe inducing to keep on for long periods. I thought AJ Style’s cue card eyes and less than interested dialogue at the start of his own tower were going to spell trouble for the general voice acting, but mostly, the Superstars who recorded lines seemed to have fun with it. Most taunts that equate in screams and shouts add a nice flavor, and the grunts are more Superstar specific than ever. As for the soundtrack, its a matter of preference, but a bit of an odd blend for a wrestling game. 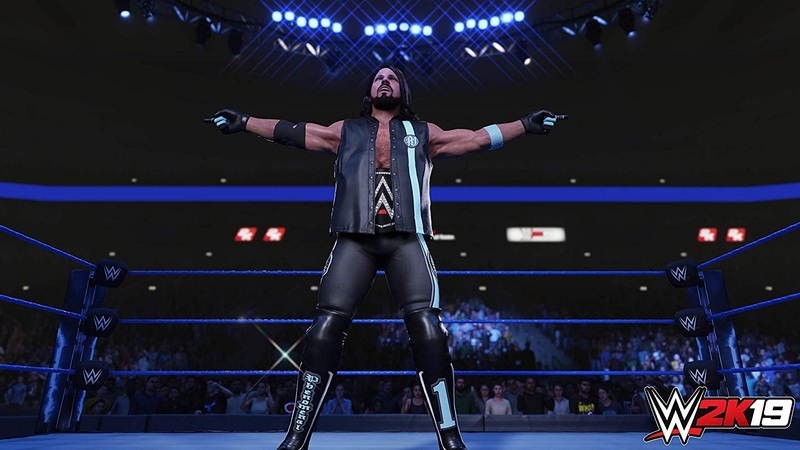 WWE 2K19 is like walking through a museum of history. On one side, you have the fun parts that you always start with. General matches in exhibition featuring your favorites. Rumbles, TLC, and every entrance you can consume. You get your nostalgia, and can even invite friends for what is a decent experience, despite some heavy imperfections. As you keep walking, you see more and more of this museum, but by this time it is repeating itself and now is just mixing up monuments to try to make it feel like you are experiencing something new with the same old statues. You shrug and keep walking. As you go forward, you cannot keep but noticing the walls are more narrow and the fun time you were having isn’t as comfortable because the exhibits on display do not fit or make sense in this tiny hallway and it is beginning to crush you. You just want some air and freedom and for the tour to be over. You go out the back, and there is a dumpster full of feces that is guarded with an admission gate with hundreds of price tags glowing in pyre as the entire area burns. That is WWE 2K19. It isn’t ok at this point to give us a game that cannot even function well enough to experience the new features that are built for it, when the core game is not even built to function correctly in the first place. There are a lot of amazing Superstars in this title, and yes, it is all we have until next year because that is how it is if you want a visually compelling wrestling game. You should never force an audience to endure mechanics that are broken from years prior and still not corrected in this generation where feedback is so easily voiced, and you should never hold out your hand for more when you did not even deliver in the first place. Get better or give it up, WWE Games. Fans deserve better, and you can do better.